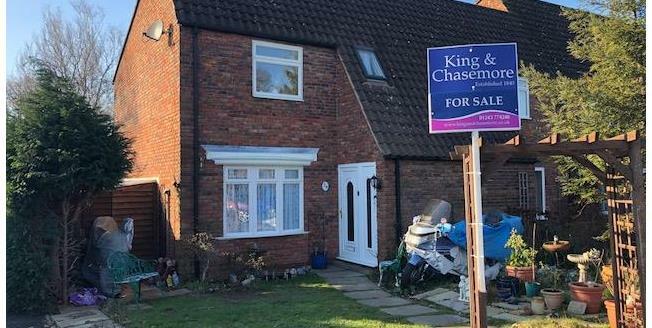 King & Chasemore are pleased to offer this three bedroom end of terraced house in a cul-se-sac position. The property is close to Oakland's Park, University of Chichester, Chichester Festival Theatre and is within walking distance to the town centre. The lounge has an ornamental fireplace. The kitchen is very rustic and is a generous size and benefits from an American style fridge/ freezer, washing machine, tumble dryer and also a dishwasher. The upstairs offers three bedrooms two of which are doubles, a bathroom and a separate WC. The Master bedroom is a spacious double over looking the rear garden. The second bedroom over looks the front with views over the playing field. Externally, the rear has a patio area, small pond and gated rear access to the green behind.